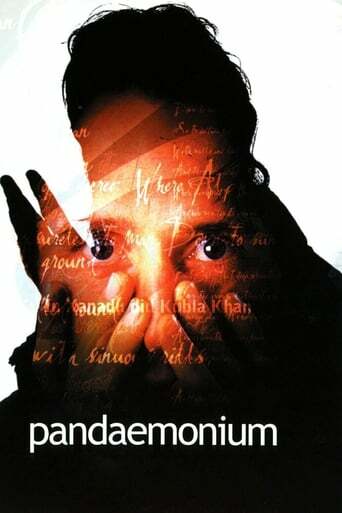 Set in England during the early 19th century, Pandaemonium evokes late-1960s America in its depiction of the relationship between Samuel Taylor Coleridge (Linus Roach) and William Wordsworth (John Hannah). Instead of going to Vietnam, Wordsworth goes off to fight against the French while Coleridge stays at home and promotes utopianism. After the war, the poets live and work together with Coleridge's wife, Sara (Samantha Morton), and Wordsworth's sister, Dorothy (Emily Woof). At first this communal arrangement works to the advantage of Coleridge--who does some of his best writing while Wordsworth stagnates--until Coleridge becomes addicted to opium. Wordsworth, meanwhile, doesn't find his voice until he abandons his friend. In 20th-century vernacular, Wordsworth is the yuppie, Coleridge the hippie.